Just two months after the most destructive wildfires in California history—an event labeled the October Fire Siege—Southern California is now the target of various fires that have burned over 250,000 acres of Ventura, San Bernardino, Los Angeles, Riverside, Santa Barbara and San Diego counties (as of Dec. 12). Five of these fires were 100-percent contained last week, while another five continue to burn. Even the star-studded neighborhood of Bel Air was under strict evacuation measures. The 16-acre Moraga Estate purchased by Rupert Murdoch—founder of News Corp, of which Move Inc., parent company of realtor.com®, is a subsidiary—was also evacuated due to its proximity to the Skirball Fire. The evacuations have now been lifted, and the estate only suffered minor damages to its vines. Over 190,000 residents are still under mandatory evacuations while firefighters are working on containing the fires. Most groups (around 4,000 firefighters) have been assigned to the Thomas Fire, which spans over 360-square-miles of Ventura and Santa Barbara counties and reached the Pacific on Dec. 5 after starting 30 miles inland the day earlier. It has burned over 230,000 acres and has destroyed at least 1,000 homes and buildings. It was 20 percent contained as of Dec. 12. Firefighters are struggling to contain the massive fires that are flaring up with the help of an enduring drought and Santa Ana winds, which essentially funnel the fires through California’s canyon landscape at high speeds. Last Wednesday, the helicopters and planes used in conjunction with firefighters could not fly because of the 50-plus mile-per-hour winds, delaying containment efforts. Mike Kelly, REALTOR® at Keller Williams Realty in Sonoma County, who experienced the October firestorms in Northern California, believes the Santa Ana winds will play a role in future buying activity. The wind’s power will be a determining factor in how long it takes to put the massive fires out. 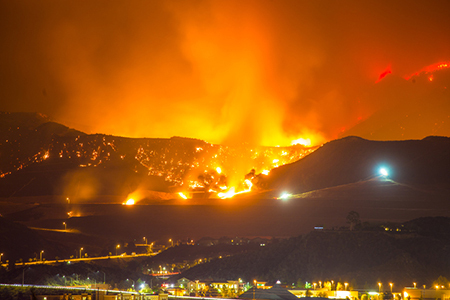 New analysis from CoreLogic shows that over 86,000 homes in Southern California are at risk due to the firestorms. CoreLogic estimates that the reconstruction cost value (RCV) in Los Angeles and Ventura counties will total nearly $30 billion. According to Zillow research, about $6.4 billion worth of residential real estate (an estimated 1,700 homes with a median home value of $2,859,000) are in mandatory evacuation zones for the Skirball Fire, while around $1.7 billion worth (about 3,100 homes with a median home value of $563,500) are in the burn zone for the Creek Fire (based on the Dec. 8 Evacuation Map published by CAL FIRE). This accounts for about 6.8 percent of Ventura County’s total residential real estate (by value) and about 6.3 percent by count, reports Zillow. While Southern California deals with the onslaught of fiery outbursts, their neighbors ot the north are still reeling from the impact of the October wildfires, which killed 44 people and reduced whole neighborhoods to ash. Adam Menconi, broker/owner of Prosper Real Estate in Sonoma County, had over 40 clients who lost their homes to the fires. “If you were in the middle of a deal, the deal is literally toast. You can’t convey something that doesn’t exist; therefore, the deal falls apart,” says Menconi of the 2,000 homes the Santa Rosa market lost, which included apartments, mobile home parks, smaller suburban homes in the $500,000 price range, larger subdivisions in the $700,000-$800,000 price range, and Fountaingrove estates that vary from $1 million-$4 million. Kelly says the housing market was further impacted by the loss of 5,200-plus homes and the flood of buyers looking for replacement properties. “Month’s supply of inventory is down 40 percent over last year with only a 1.4 month’s supply and [an average of] 44 days on the market (DOM),” says Kelly, adding that the new construction market is up 25 percent over last year and that the market is at 99 percent of listing price for all sales—signaling an incredibly tight market, as indicated by the number of sales that are over 110 percent of the asking price. Displaced individuals are jumping at any opportunity to own a home again, even if it means purchasing way over market value and investing more funds than they may get in return when it comes time to sell. Californians impacted by the wildfires are facing various challenges. Many are thinking of rebuilding, but may be priced out of the area. In addition, lots are selling for much less, but residents will have to wait and see if new building codes will be imposed. One of the biggest challenges are insurance claims, which are taking too long for buyers who need their reimbursement to qualify for a home loan, and certain policies are not enough to recoup losses. Menconi states that there have been varied results when it comes to insurance. According to California’s insurance commissioner Dave Jones, property damage claims in response to the Northern California fires exceeded $9 billion. The figure encompasses data from 260 insurers that reported total claims as of Dec. 1, which included damage to more than 21,000 homes and 2,800 businesses. The newly displaced population, combined with price gouging and disaster fraud, is also exacerbating an already widening homelessness problem in Santa Rosa. The FBI has been called in to address fraudulent activity, such as duplicate claims, that dramatically increased in response to the fires; however, Menconi doesn’t believe these challenges will detract buyers from purchasing in the area. Although California has suffered unimaginable losses, and has to repeat the experience with the newly sparked wildfires in the south, real estate professionals and state residents are coming together in aid and support. While the real estate community has provided emotional support during the October Fire Siege and now the Southern California fires, it has also set up fundraisers and donation sites to help agents and families who have been impacted. In addition to relief efforts provided by individual brokerages and agents, the California Association of REALTORS® (C.A.R.) is offering financial assistance via grants to REALTOR® family members who have been affected by the wildfires. “Grants provided by the fund are used to help members of the REALTOR® family—REALTORS®, their staff, and association members and their staff—who have incurred substantial losses due to wildfires and other disasters by distributing grants of $1,000 to $10,000,” says a statement the C.A.R. website, where individuals can donate to disaster relief.